Zone 2 London Overground and DLR station on the East London Line. 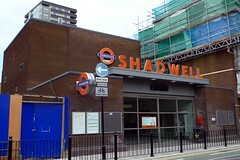 The stations are physically separate; our photo shows the London Overground part. Last edited 2013-10-11 10:33:29 (version 10; diff). List all versions. Page last edited 2013-10-11 10:33:29 (version 10).